Kimiyo Foujita (Marie-Ange-Claire/Kimiyo Foujita) 藤田君代 fourth and last wife of Foujita. During Foujita – Madeleine’s partnership, 1935 Foujita started a sexual relationship with ‘waitress’ Kimiyo Horiuchi (新橋の料亭のお運びさんだった水戸出身の堀内君代）, who then became his publicly known mistress 妾（お妾長屋）/ 二号さん（二号さん長屋）. The fight between Kimiyo and Madeleine ended in Madeleine’s obscure death in 1936. Officially married in France 1954, next year changed Japanese citizenship into French. In 1959, together with her husband, converts to Catholicism in the Cathedral of Reims, new identity as ‘Marie-Ange-Claire Foujita’. Died in 2009. 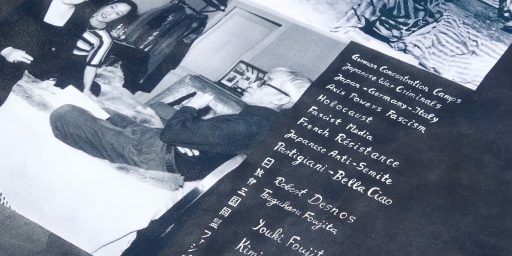 She destroyed Foujita’s artistic legacy. ロベール・デスノス藤田・ユキ藤田君代藤田嗣治・レオナール・嗣治・フジタレジスタンス戦争犯罪人戦争画新作 「ロベール・デスノス、藤田嗣治、藤田ユキ、藤田君代。レジスタンス 対 戦争犯罪人。」 New Work "Robert Desnos, Tsuguharu Foujita, Youki Foujita, Kimiyo Foujita. Résistance vs War Criminal."